40-Inch Compact Sound Bar is designed according to the fashionable aesthetics. it has sleek and environmentally friendly Fabric in the front of Sound Bar, "Button" on the most right side with ABS made nice appearance. Located in everywhere, it's an embodiment of generosity for its' owner. 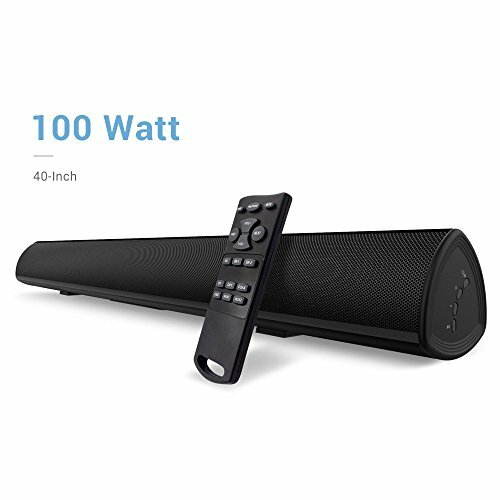 The Sound Bar is well-suited if wanna hold a party, meeting, classroom teaching or other activities; listen to your favorite music in your Comfort-Zone when tired and exhausted after out of duty; watch movie with incredible sound experience in your tranquil home instead of going to the outside, PPL-Gathered Cinema for saving your time and Pocket-Money. Importantly, enjoy the refined, high-fidelity, unwavering sound from your other devices that can connect with it or on its' own. Spice up your life with energetic Sound Bar. Upgraded Version: Noise-free Sound, Boosted Bass, Bigger Power (Max up to 100Watt). Utilized Noise-free technology to ensure every layer of Audio is delivered flawlessly. Extended length to 40 Inch which is Meticulously- designed for your smart TV and sweet Home. Rock-Solid Sound: Quad built-in 3-Inch imported, advanced full-range drivers; dual high-sensitivity spherical silk film tweeter drivers, twin craftsman-processed bass reflex tubes. All they only serve for serious stereo sound with exceptional clarity and zero distortion. According to our substantial survey, most speaker drivers are less than 3-Inch in the market. Effortless Connectivity: 4.0 Bluetooth lets you wirelessly stream from any Bluetooth devices. Or Optical with fast-transmission connects your TV. Meanwhile, it also supports Coaxial in, Aux in, RCA in, USB. DSP Technology: Thanks for the Digital Signal Processing, there are three different modes (3D, SR-1, SR-2) for your option. Be footloose and start to enjoy what you like.